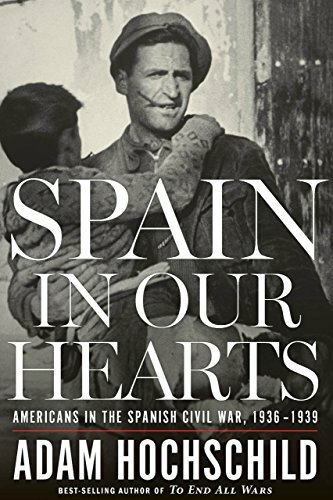 Hochschild’s Spain in our Hearts is subtitled “Americans in the Spanish Civil War,” though the book is not, in fact, about the 2,800 American volunteers in the International Brigades. Instead, his account is told through the experiences of a select number of individuals (not all of whom are American) within the cataclysmic war in Spain. And they are select, for Hochschild’s characters are all highly-educated, middle-class writers. The notion of a poets’ (or writers’) war is clearly still attractive to writers and publishers, which neither time nor the undoubted presence of an overwhelming proportion of manual workers among the volunteers, seems to have dispelled. Admittedly, the author has chosen his stellar cast shrewdly, including the two most famous writers of the civil war (in English at least), Ernest Hemingway and George Orwell. While Hochschild seems to have little new to say about the latter, his account of Hemingway’s participation in a guerrilla raid behind enemy lines, which clearly inspired Robert Jordan’s mission in For Whom the Bell Tolls, may come as a revelation to some readers. Jordan’s real-life counterpart, the Professor of Economics and Abraham Lincoln Battalion commander, Robert Hale Merriman, also features, as does socialite and reporter Virginia Cowles and journalist and International Brigader, Louis Fischer. Accounts of the war’s impact on the characters’ personal relationships are a recurring theme: Hemingway and Martha Gellhorn obviously, but also Bob Merriman and his wife Marion, POUM supporters Lois and Charles Orr, and the cross-Atlantic war romance between American nurse, Toby Jensky, and English sculptor and International Brigader, Jason “Pat” Gurney, who had suffered a nervous breakdown after the appalling carnage of the Jarama battle of February 1937. Gurney’s account of the war, like Hemingway’s and Orwell’s, has been frequently cited and retold and it’s difficult to find much within Hochschild’s account that is strikingly original. Certainly the author’s debt to earlier studies, particularly those of Paul Preston and Peter N. Carroll (which he generously acknowledges) is clear. So, why then, should this new book be of interest? Principally, it is because of the sheer quality of the writing and storytelling. Spain in our Hearts is a rewarding and enjoyable read. The elegant prose is further illuminated with some of the most telling anecdotes from the literature. It is also a pretty fair and balanced account. The author is fortunately too sophisticated to fall for the simplistic, binary notion of a war between two equally repugnant totalitarian philosophies, in which “Spain” is merely a passive bystander. Nor does he make the mistake of seeing Republican Spain as a satellite state of the Soviet Union, though not denying that the supplies of military materiel and the organization of the International Brigades gave Stalin great influence. This “devil’s pact” was really the only option left to the Republic once the western democracies had refused to come to their aid. Hochschild will come into some criticism for justifying what has become seen as “the Communist line” over “war or revolution first” that Orwell discusses in Homage to Catalonia. Balanced is not the same as neutral and Hochschild’s Republican sympathies are plain to see. Perhaps the clearest example is his illuminating account of the role of Torkild Rieber, the pro-Nazi C.E.O. of the American oil company, Texaco, in supplying millions of gallons of oil to Franco on credit. To this can be added the 12,000 trucks received by Franco from General Motors, Studebaker, and Ford. As Hochschild points out, the admission by the undersecretary of the Spanish foreign ministry that Franco could not have won the war without U.S. trucks and U.S. oil credits reveals just how significant this contribution truly was to the Nationalists’ cause. Hochschild’s Spain in our Hearts is much more than just another account of Orwell and Hemingway in Spain. It offers the reader a window into the personal, emotionally searing, experiences of those who decided to make the Spanish cause their own. As Albert Camus, from whom the book’s title is drawn, wrote just after the end of the war, “it was in Spain that [my generation] learned that one can be right and yet be beaten.” Hochschild’s beautifully crafted book explains why, for them, the Spanish drama was and remained a personal tragedy. Richard Baxell is an historian, author and Research Fellow of the Cañada Blanch Centre at the London School of Economics and Political Science. He is currently Chair of the International Brigade Memorial Trust. An excellent review. While more books dealing with working class men and women who volunteered for Spain are certainly needed, Baxell’s volume is exactly what the author says, it’s: “much more than just another account of Orwell and Hemingway in Spain. 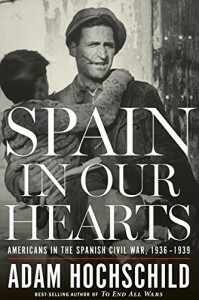 It offers the reader a window into the personal, emotionally searing experiences of those who decided to make the Spanish cause their own.” As I am (I assume) one of the older living “kids”s of ALB volunteers, I’m proud to number my father Alvah among those who put their lives on the line for the cause of the Spanish people.